ARANAYAKE, Sri Lanka, Jun 2 2016 (IPS) - The picture could be straight out of a tourist postcard – a sleepy green mountain with misty clouds floating above the canopy – if not for one fatal flaw: the ugly gash running right through the middle. This is the Egalpitiya mountain in Aranayake about 120 kms from the capital Colombo. Parts of the mountain came down during the evening of May 17, burying three villages. Officially, a fortnight after the tragedy, 48 are dead and 101 remain missing. Yet on the ground, government population figures say that over 4,400 people lived in these three villages, and hundreds are still unaccounted for. The Sri Lanka Red Cross says that at least 220 families lived in the villages and only dozens have been traced since the tragedy. Aranayake was the worst episode of a nightmarish week between May 15 and 22 when the country was lashed by incessant rains. The landslide area received over 350mm of rain, according to estimates by the Meteorological Department. 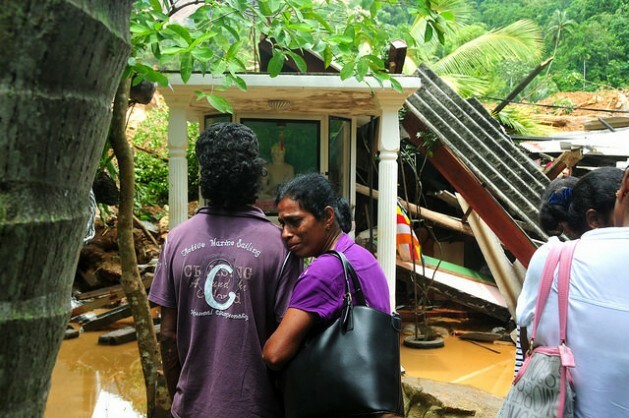 The floods and landslides affected a total of about 400,000 people, and damaged 128,000 houses, according to Finance Minister Ravi Karunanayake, who said at least a sixth of that would have to rebuilt. “They have a road above, but it is not sure when [that] will collapse. They were under seven days of water, that is no joke,” he said a week after the floods hit. The government estimates the total damage bill to be between 1.5 and 2.0 billion dollars, possibly even as high as 3.0 billion — the total national damage assessment of the devastating 2004 Asian Tsunami. According to the Ministry of Disaster Management, over 90 percent of the affected population had already been slammed by other natural disasters in the last five years, such as the floods of 2013 and 2015. This is hardly the first time that Sri Lanka has been devastated by an extreme weather event. Just days before the floods came, a joint government-World Food Organisation report detailed the long-term risks faced by the island. “Climate risk is one of the key challenges to ensuring food and nutrition security in Sri Lanka. Climate variability and change disproportionately affect the poorest and most food-insecure through a combination of decreasing crop production, decreasing resource availability, higher magnitude of disasters and unpredictable weather,” warned the report, titled Sri Lanka Food Security Atlas: Livelihoods, Food Security, and Resilience. The report said that Sri Lanka has been facing a cycle of extreme weather events for the last decade. Much of the risk is from floods and drought linked to erratic rain patterns. In just the last five years, Sri Lanka has experienced four major floods (2011, 2012, 2013 and 2016), and three major droughts (2012, 2013 and 2014). Water and water availability will be main points of concern. As the population grows, so will the demand for water, the report said, noting that water needs for rice, the island’s largest crop, will increase 23 percent by 2050. The report also said that in the last decade, the number of Sri Lankans affected annually by climate-related hazards has nearly doubled, from an average of 400,000 to 750,000 today. As is so often the case, the poorest sections of the population are most the vulnerable. Annually, at least 750,000 Sri Lankans were categorised as food insecure due to climate risks — an increase of over 100 percent since 2012. In a bid to minimise harvest losses due to erratic weather, the Meteorological Department has been trying to issue detailed weather bulletins to farmers. In fact, in early April, when the annual South Asia Climate Forum predicted that there would be above average rainfall in the incoming monsoon season, this information was widely disseminated within the country. Still, one of the biggest stumbling blocks is the lack of awareness among rural farmers. Sarath Wickramasinghe, a disaster risk reduction specialist with Sri Lanka Red Cross who works in the North Central Province, said that farmers still relied on tradition that dictates the harvest cycle. “They are traditionally geared for the monsoon, which comes twice a year. Even some officials are, [and] that mindset needs to be changed,” Wickramasinghe said. The government has also been encouraging farmers to diversify. When harvest failure loomed in 2014 due to prolonged drought, the government advised paddy farmers to cut down on paddy extent because the crop is heavily reliant on water supply, and shift to drought-resistant crops like maize, chili and bananas. The WFP and the government also hope that with better infrastructure and businesses moving into the former conflict areas in the North and East, where a large portion of the food insecure live, the standard of living will also improve.